Navigation is important when you are out in the wilderness, and sometimes a map beats electronic devices that require charging. The main problem is that paper maps can become unreadable when wet. Fortunately, Seal Line’s HP Map Case keeps maps and other documents dry. They have lash points and a strap for easy transportation, and the cases also prevent UV damage. PVC-free materials are more environmentally friendly than other plastics, and the cases are highly durable. If you plan to rely on paper maps while trekking in possibly wet weather or boating, a Seal Line HP Map Case is a necessity. If you would rather use an electronic GPS or want to carry music players, a cell phone and other electronic gadgets on a trip, Seal Line eSeries Cases can keep your gear safely dry. They seal water out and are clear for easy visibility and organization. You can even use touch screens from within the cases, so you do not have to take your phone out and risk getting it wet or dirty. The cases are also useful for sealing wet items on the inside, such as a shampoo bottle that you do not want to leak within your luggage. Another electronics storage option, the Seal Line Mobile Electronics Case, attaches to a bag’s shoulder strap for convenience and easy access. While not submergible like the eSeries Cases, the Mobile Electronics Cases are made with water-resistant neoprene to prevent water damage from splashing or wet weather. Velcro closures make the cases easy to open quickly, and the material is also durable enough to resist tears and hold up when scraped against rocks or other surfaces. For commuting in the city or for day trips, no pack can beat the watertight seal of the Seal Line Urban Backpack. It is made from PVC-free polyester with a PU coating. This material is durable as well as waterproof. A roll-top design allows easy access to items and compression when you pack light. The straps are breathable for comfort during intense activity. It holds a generous 17 liters of volume and has an external zip pocket. You can also attach additional pockets to the pack for even more storage. Whether you spend time commuting by bike in a rainy urban environment or like to trek in some of the most remote areas of the globe. 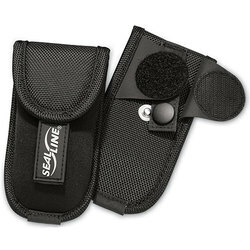 Seal Line is the brand of choice for outstanding waterproof protection. The brand’s items facilitate organization, and the brand itself also makes efforts to protect the wilderness that adventurers hold so dear.